About 4 years ago, I invested in some new wheels. Easton EA 90TT. To be honest, I didn’t do too much research. I just trusted a few friends who swore by Easton. I’ve been happy until this year, and now these wheels make me down right nervous. In the past 10 months, I’ve broken 3 spokes on my rear wheel. When a spoke breaks on CK (my Scott Plasma bike), I’m totally out of luck. The wheel doesn’t turn. I’m stuck. Thanks to these broken spokes, I’ve hitchhiked in the East Bay, called friends for rescue rides twice and this past weekend was sagged in the last 10 miles of the Marin Century ride. Why is this happening? And, what do I do if a spoke breaks during IM Canada? I asked a few of my buddies who have been in the cycling industry for a while for their advice. Turns out Easton wheels have a bit of a bad reputation! They are known for having some structural problems, including broken spokes. I think I’ll look into renting the Zipps! Categories: Logistics, training | Tags: cycling, gear, gearadvice, wheels | Permalink. I have been in dire need of a new pair of cycling and/or tri shorts for a few weeks. With my longest ride to date scheduled for this past Saturday, I figured it was finally about time I made my way to Sports Basement to find a new pair of shorts. It seems I’m not the only Ironman athlete who finds gear shopping an acceptable way to spend a Friday night. I bumped into two other IM Canada folks at the store. I may have tried on every pair of shorts in the tri department. Zoots have an awful leg seam and rough edge on the padding. 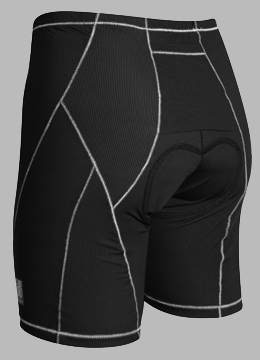 TYR shorts have a ridiculous design that makes it look like I put a leotard over my bike shorts. Sugoi were cut very small. And just when it seemed like I would suffer the same fate as Goldilocks, I found the shorts that were just right! De Soto 400 mile is it. I was a little worried that the shorts were a little sheer, but friends assured me they were ok. I wore them for the Marin Century on Saturday and had no complaints. I think I found a winner for Ironman Canada! I did add one more item to the wish list once I found the shorts (thanks to talking to the other IM athletes). It’s a rather unusual piece of gear, but I covet an M-dot diamond necklace. That may be my first post-race purchase! I may “owe it to myself” when I complete this third Ironman. Categories: IMCanada | Tags: cycling, gear, gearadvice | Permalink. I just got these new sneakers, thanks to The Nation’s Triathlon! Craft and Karhu are sponsors of this year’s race – and I’m a brand ambassador for the race. I wore the sneaks at the Wheelworks Multisport track practice at Tufts University last night. The shoe has a low profile around the ankle, which made it feel a little loose on my left foot. By the end of the workout, my left toes were rubbing a little too. I do LOVE the colors! And, the shoes are incredibly light! Overall, I was satisfied with the shoes and plan to put some more mileage on them. I’ll still wear my trusty Brooks Glycerin for IM Wisconsin though. The standard saddle that came with my Scott Plasma has been driving me crazy! Short or long rides, it was uncomfortable! And, I’m not that picky about my seats! So, I was in the bike shop after a 75 mile ride on Saturday and quickly realized I had no more time to waffle about getting a new bike seat – IM MOO is less than a month away! The selection at the shop was minimal, but the guys were cool and let me test out a few. How you decide on a saddle online is still a mystery to me. I selected the Specialized Toupe Saddle. It’s a minimalist road saddle. I love that its light and small! It’s probably not the proper saddle for my bike. But, I liked it after a 75 mile ride and in regular shorts. So, that’s got to be worth something. Oh, and Wheelworks said if I didn’t like the seat after a week, I could exchange it! How great is that? We’ll see if I’m still satisfied after my big ride this weekend. Categories: IMoo, training | Tags: gear, gearadvice, runningsneakers, saddles | Permalink.